The main feature is that the surface is not rough; it is very smooth. This means that, as well as being better for cleaning and maintenance, it is much more pleasant to the touch, having a smoother texture. It is always available in a wide range of colours and a variety of formats. The new Safe Steps collection achieves the perfect combination of the elegance of glass and the highest non-slip safety. The new Safe Steps collection complies with both the technical building code and the most stringent international standards. This even applies for wet, slippery exteriors with pronounced slopes. It is excellent for both indoor and outdoor wet areas. Slip resistance DIN 51097- Classification C.
Slip resistance DIN 511310 - Classification R10. Slip resistance (Pendulum) UNE-ENU 12600:2003 - Class 3. The Safe Steps collection combines safety with a new, much more pleasing texture. The Safe Steps collection is smooth and pleasant to the touch. The surface of the Safe Steps tiles is not coarse. The Safe Steps mosaics are not rough. Safe Steps are not aggressive. This system facilitates cleaning, both during the installation of the mosaic and also during its maintenance. There is no problem using the usual cleaning products, both domestic and industrial, with Safe Steps. The Safe Steps collection is perfectly compatible with the use of the normal pool cleaning products, from the chlorine to the salt used for swimming pools. 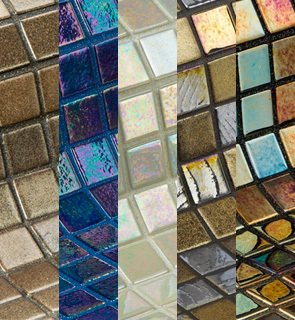 The Safe Steps mosaics have passed the Chemical Resistance test (UNE EN ISO 10545-13). The Safe Steps collection from Ezarri incorporates the JointPoint® system, which offers maximum ease of fitting and also maximum adhesion. Public and private swimming pools.